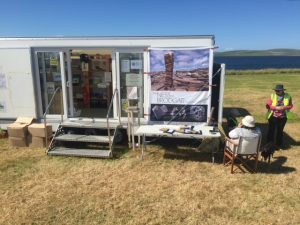 Volunteers from the Orkney Archaeology Society arrived early today to welcome visitors to the Ness, after spending the last week setting things up. 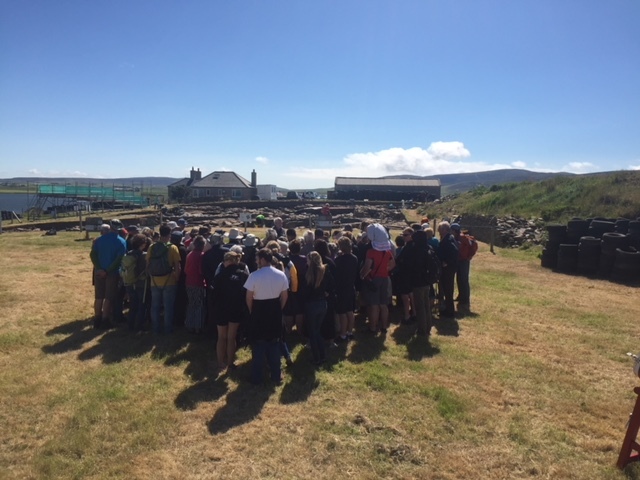 We were expecting it to busy as it was the first day, the sun was shining and BBC were re-running the three – part documentry on Orkney from last year featuring the Ness of Brodgar. A feeling of excitement filled the Ness as we all prepared for another eight weeks of helping, chatting, and seeing old friends. If you haven’t been to the Ness then come to one of the free guided tours at 11am, 1pm and 3pm and afterwards visit our great little shop on the site, staffed by Sam and helped by at team of volunteers. If you have any money left after your visit to the shop and having purchased a pin and marked a square on the map of the dig ( Only £10 all proceeds of this goes to the dig ), then please feel free to donate what you have left ! If you have been before, please come again, tenches are being extend and there is the hope for more great finds! The Ness relies on your support as most of its funds come from members of the public.